The following post is sponsored by FitFluential, LLC on behalf of Reebok. All opinions are my own. Yesterday was one heck of a busy day in New York City, but I enjoyed every minute! 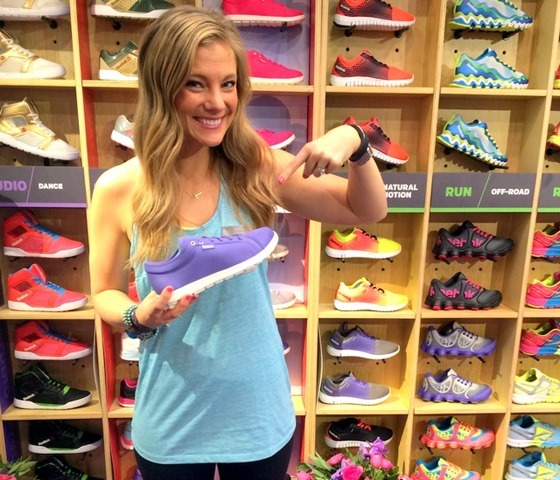 When my alarm went off in the morning, I quickly changed and got ready to walk to the Reebok Upper East Side FitHub with two of my favorite blogging friends and fellow FitFluential ambassadors, Gina and Heather. After a brief 20-minute walk in the beautiful NYC weather (we totally lucked out and missed the bitter cold! 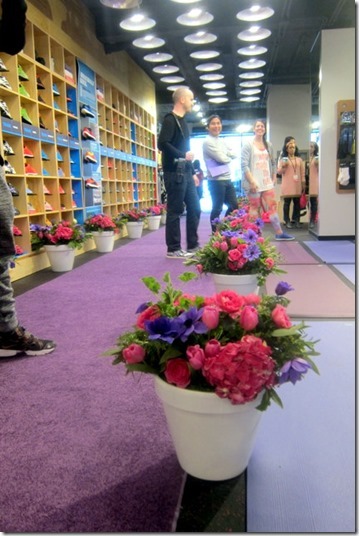 ), we arrived at the FitHub and walked inside to find the store completely decked out in pink, soft shades of purple, pretty florals and crystals. The FitHub was transformed for the Skyscape launch party! When Reebok first sent me the Skyscape shoe back in December and asked for my feedback, I told them that the Skyscape quickly became my go-to errand-running shoe. The shoe is made out of foam and the same materials used to make lingerie, so it is incredibly comfortable, lightweight (only five ounces!) 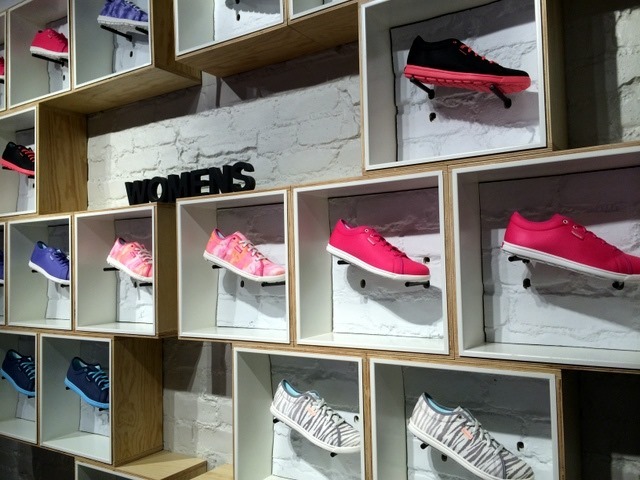 and has a more feminine look than a basic athletic gym shoe. It’s also machine washable which I figured might especially interest those of you walking around slushy snow right now! 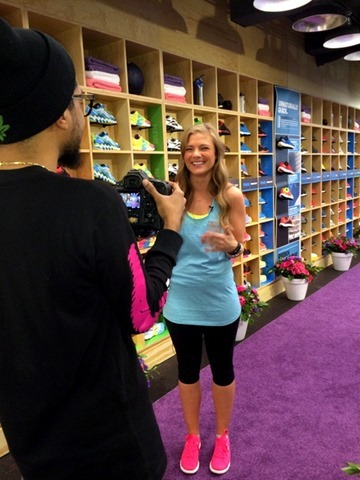 During the event, I was asked a few questions about the new shoe and my thoughts about the Skyscape launch event on camera and I’m pretty sure I talked with my hands more than my mouth. 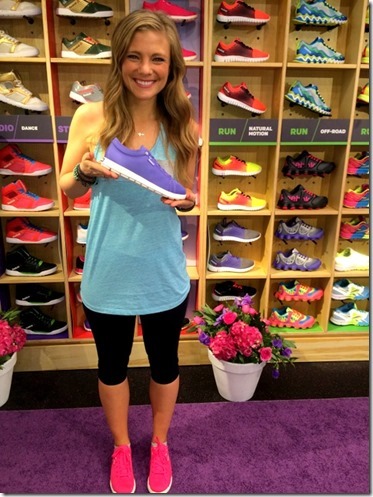 As I explained to the cameraman, I typically wear my Skyscapes around the town with leggings and a pullover, but I love the way Reebok showed the shoes with different looks during the launch party. I am kind of weird about pairing sneakers with “real” clothes rather than gym clothes but the models wearing the Skyscapes looked adorable in non-gym clothes, too. I loved the Skyscapes paired with a casual dress and a motorcycle jacket. And I had a hard time getting a quality picture of the look on the right below, but it was my favorite. During the launch party, I had a lovely time meeting Roo, the talented writer behind the blog Neon Fresh and loved seeing Jenna again! 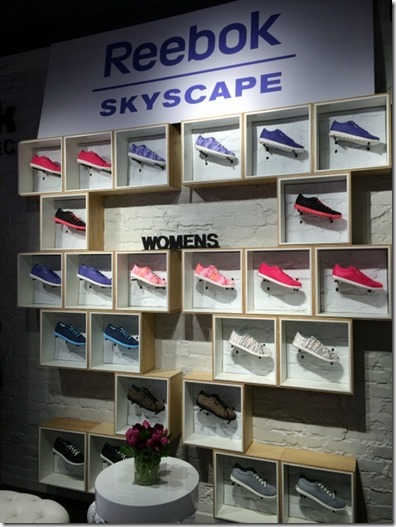 Quite a few of us spent some time eyeing the new Skyscape colors and patterns on the display wall. My favorite is the white Skyscape with the light gray stripes. Funky and fun! 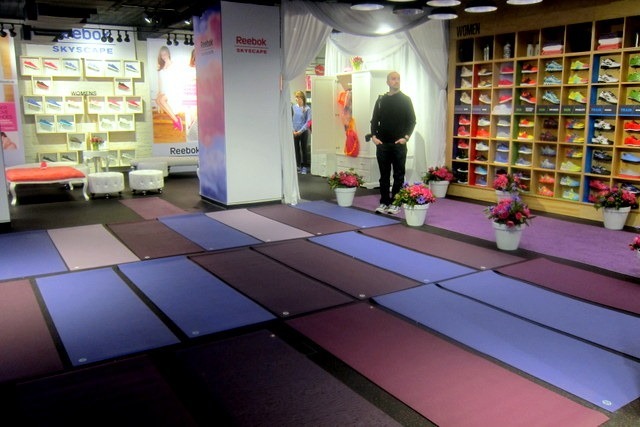 Since the launch party took place at a Reebok FitHub, it naturally had to include a workout since Reebok FitHubs are interactive stores that offer group exercise classes in addition to selling Reebok footwear and apparel. As we took our place on the yoga mats set up for us to use in the center of the room, Mary Helen Bowers joined us to take us through a Ballet Beautiful class. I felt very fortunate to have the opportunity to do a quick workout with her since she is one heck of a talented ballerina and instructor! Though the workout was only about 20 minutes long, Mary Helen took us through ballet movements and exercises that reminded me a lot of barre classes. Lots of pulsing and burning! We were not allowed to take photos of Miranda without approval, but were given permission to snap one group photo and had the chance to talk with her for five minutes before she had to rush off to Good Morning America. Her healthy living tips include: Make time for yourself and view your workout as a way to pamper yourself and your body. A short, 10-minute workout is more beneficial than nothing. Don’t neglect sleep and make sure to drink a lot of water and eat healthy, balanced meals. As the Skyscape launch event came to a close, I thanked my friends at Reebok for allowing me the opportunity to travel to New York City to learn more about their latest product. 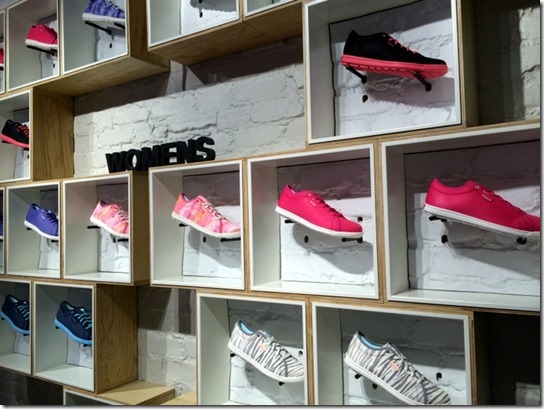 I am so grateful to Reebok for inviting me to the launch and had so much fun exploring the FitHubs, chatting with the incredibly talented Mary Helen Bowers, meeting Miranda Kerr and spending time with some truly wonderful blogging friends. It was a whirlwind trip and I can’t believe I’m already back in Florida. NYC, I miss you already! This trip looked SO amazing! Glad you had a great time!! 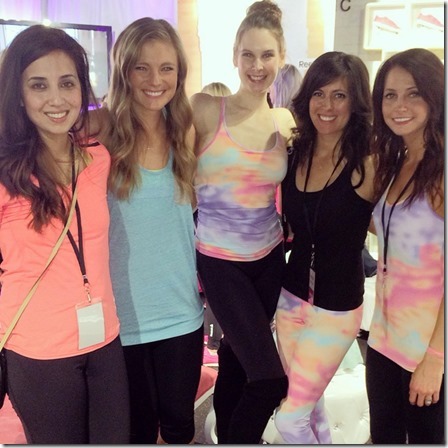 i want those neon yoga pants!!! So cool! I saw the video pop up on Facebook last night, and I’m super jealous. Miranda Kerr is my favorite. I like that these are less gym and more fashionable. Kind of have a Nike feel to them and I love the colors. Um, I somehow missed this post, but wanted to say that I think it is super cool and amazing that you got to meet Miranda Kerr… and girl- you look great sitting next to her!! Who can say that when they are next to a super model? !